Over the last few months, the newly elected State Government has pursued a policy of abject neglect of vital projects like the $ 2 Billion Vizhinjam deep water port, while focusing on sure-fire financial disasters such as the proposed mass transit system in Ernakulam and a catastrophically expensive bullet train line. A Happy New Year everyone and hopefully 2012 will not be as much drought-prone in terms of articles as 2011 was, since I have finally completed my work at MIT. I know that the traditional year-end wrap up and the look-ahead articles are still woefully pending but those should be posted in the next few days, hopefully! Although I am in the midst of wrapping things up here at MIT and moving to a new apartment in Cambridge, there is this one issue that I felt couldn't wait much longer. Scanning through the Kerala media of late, one would be forgiven for thinking that the State's single large infrastructure project has vanished off the face of the planet. It finds no mention in the news of recent weeks, which have tended to be dominated in equal measure by old men demanding monopoly rights to play with their toy trains and even older dams that threatened to unleash disaster but very evidently didn't. 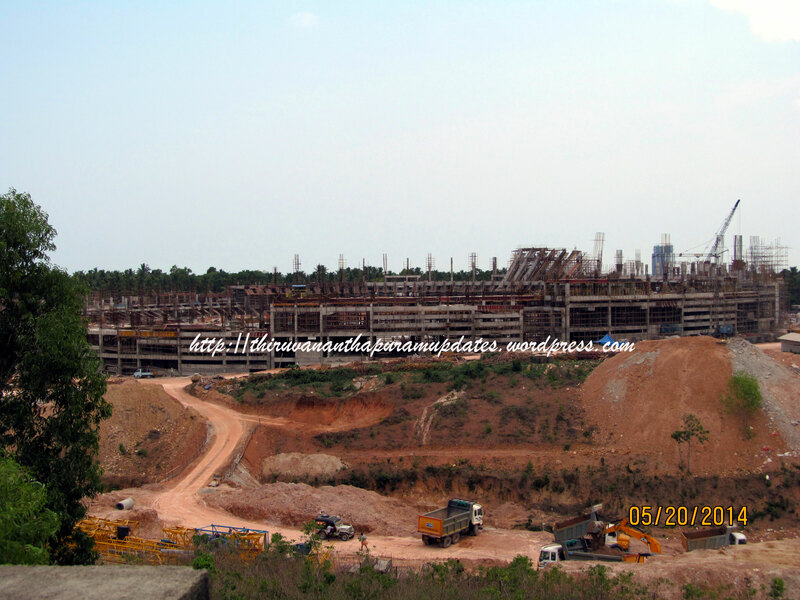 It has been fully six months since the financial bids for the $ 2 Billion Vizhinjam deep water port were received. Since then, the bids submitted by Indian port giant, Adani Ports, and the consortium of Indian conglomerate Welspun and Australian construction giant, Leighton, have been gathering dust, probably in some back drawer at the office of the nodal agency, VISL. Why? Because, everyone has been sitting around, sipping chai and munching biskoots, till due clearances were received from the Union Ministries of External Affairs, Defence and Home. The Defence Ministry's clearance was received on November 15th while the Ministry of External Affairs gave its nod to Leighton on December 8.Ever since the start, it was evident to everyone, except the powers-that-be in the Secretariat, that Mundra would flunk the Home Ministry for whatever reason, because they have flunked every single time they were examined in the last year or so, on no less than four separate occasions. Despite this, the State Government chose not to pressure the Home Ministry to speed things up, perhaps nervous about the inevitable outcome, and waited till January 3, when the latter let the axe finally drop on Adani, leaving the Welspun-Leighton consortium as the lone bidder for the project. Despite clear precedents existing for single bids being successfully awarded in ports and other major infrastructure projects and the requisite mechanism being included in the bid documents, the Government has refused to take a decision on awarding the bid even though three weeks have elapsed since things were made very easy for them. Although it was announced that a decision would be made in the Cabinet meeting on the 11th of January, nothing transpired - except more chai and biskoots! And so, the current Government's sordid attitude towards the one project that could change the future economic trajectory of the State continues. When the Government recently, convened a much-trumpeted seminar to discuss infrastructure, it named four "priority projects". Shockingly, Vizhinjam didn't make that list. Surprise, surprise! It seems that land acquisition for the project has also ground to a halt since the change of Government while no progress has been made in tying up the funding needed for developing the infrastructure in the current "landlord" model of development. Whereas, the State has been very willing to take its begging bowl to international funding agencies like the Japanese International Cooperation Agency (JICA), the ADB or the World Bank for other projects, it has instead opted to take its most important infrastructure project to the commercial banks which is a much more expensive and risky proposition. Admittedly, this was first proposed by the previous Government, but then they are historically wary of international development finance institutions. And despite making a lot of noise about awarding the construction tender in March (yes, really, less than two months from now! ), it is not even clear whether the project consultant for the construction aspect of the port, AECOM, has visited the site yet. All in all, one suspects that precious little has happened while the powers-that-be have focused their attention on the more "important" projects (I wonder whether India's deepest port even makes the Top 10?!). And to add insult to injury, the Ports Minister has been desperately trying to divert a proposed ship repair and building yard that Cochin Shipyard Limited wants to locate at Vizhinjam because of its deep draft, proximity to shipping lanes and the port itself, to Azhikkal which has none of these attributes. Fortunately, opposition from quarters ranging from the local Panchayat to MP Dr Shashi Tharoor, together with the the project proponent's inevitable realization that only Vizhinjam or its immediate neighbor Poovar would be suitable seem to have thrown a permanent spanner in this machination (or so we hope! A report on the final location of the yard which was supposed to have been released by November 30 has not seen the light of day yet.). In short, from the prevailing attitude and interest, Vizhinjam may be mistaken for a project in a neighboring State, if not across the border in Pakistan! Seems like this is one golden goose that nobody can see for what it can offer....sigh! Now, we can't say that our elected Government has been all silent on the question of infrastructure. No, they have been very vocal and busy indeed, the only detail seems to be that they have a curious propensity to focus on pachyderms of the white variety. Indeed the current Government has been going to extremely legally tenuous links to keep one of them on its feet, barely. In a State where even the smallest PWD tender's legality and transparency is questioned, the State Government has just broken all conventions and regulations to award a Rs 300 Crore assignment without even the pretense of a bid. Cabinet Ministers and even Chief Ministers have been hauled to court and even to jail for far smaller contracts, but apparently this is okay because otherwise the apparent 'god of mass transit' would walk off the project because he believe that his pet DMRC shouldn't be put through the minor "indignity" of a global bid. Mr Sreedharan (the afore-mentioned divine entity) and his minions believe that even the Rs 300 Crores or 6% of the currently tossed up project cost of Rs 5000 Crores is a "discounted price" as opposed to the usual 12.5% that they apparently rob from everyone else! That sort of consultancy fees would blow the socks off even the priciest global consultants, the likes of Bechtel or PB whose fees for the greatest urban engineering project of all time - Boston's $ 22 Billion (Rs 110,000 Crores) Big Dig - was between 7-11%. The Big Dig was in a very expensive market, whereas DMRC's costs, bench marked to Indian labor costs, which form the bulk of the project management consultant's costs, would be much lower. Personally, I have only heard of figures well south of 5% for these services, especially for large infrastructure projects. Whatever be the case, it is ludicrous to imagine that a contract of this size can be awarded without a bid. To put this in perspective this amount is more than the original tender for the entire Trivandrum Road Improvement Project! It's not as if there are no other agencies executing mass transit projects in India. The Hyderabad and Mumbai mass transit projects are doing very well without DMRC, and there is no reason why any one of dozens of the major consultants around the world could not offer a better price than the DMRC. Even the over eagerness of the DMRC and, its newly retired ex-boss and the most recent addition to the Indian pantheon, should raise an eyebrow or two. When the prime proponent himself has gone on record to say that heavy rail mass transit systems are not suitable for cities with populations less than 4 Million people, it is mystifying why the same concept is flogged for a city with less than half that number. The small print is that the project in Ernakulam would utilize light rail technology, which is essentially an elevated tram and bears little resemblance to its bigger cousin in Delhi. It will have just 2-3 small cars per train and have a fraction of the carrying capacity of the systems in Delhi, Bangalore, Chennai or Mumbai. Furthermore, other than a few extensions proposed in the future, there is still no comprehensive plan for a network. A single line mass transit network is a recipe for failure, as has been made painfully evident in many cases across the world, including our very own Kolkata Metro, of which Sreedharan was part of decades ago. 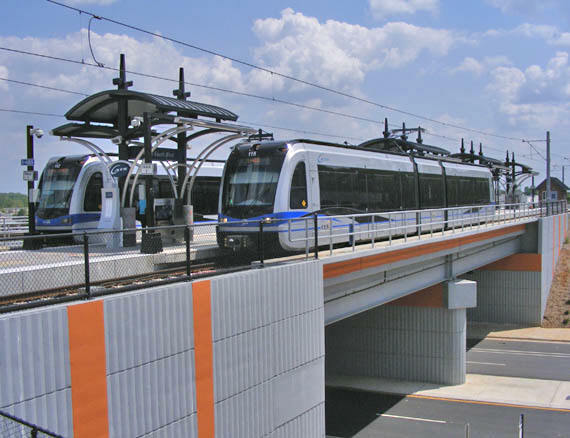 What everyone's expecting.....Heavy rail "Metro"
The reality - Elevated Light Rail!! Essentially a gigantic hoodwink is in progress here, which the proponents have realized cannot be funded through a partnership with a private investor because its is clearly financially infeasible and hence is being funded by a combination of State and Central funds and a massive loan from JICA. And one wonders where all this money is going to come from. The mass transit project essentially benefits only the city where it is located, as opposed to a project like Vizhinjam which benefits the entire State's economy and that of the nation itself.Will the State contribution and the money needed to pay back the JICA loan be collected through local taxes, as it should be, or funded from the State treasury, from everyone's taxes, as it is most likely to be? A decision of this nature cannot and should not be left to the demands of one individual, however revered he be. What happens if this individual changes his mind tomorrow or becomes unable to participate in the project for any reason, will we leave the project unfinished??! No, a project of this scale has to be dependent on capable agencies and robust management structures, not on individuals! And the DMRC has itself been in trouble with the top Government auditor, the Comptroller and Auditor General of India's office, which has accused it of lax safety procedures and of being a fiefdom of its own (Sreedharan who abruptly left office at the odd age of 79, denies these allegations and says that "only results matter" while the Government conveniently refused to table the report in Parliament). Sadly, both the Government and the Opposition, not to mention the media and the general public, seem to be in thrall to an individual. If one were so inclined, one could suspect this gentleman is most interested in a cushy retirement posting close to his ancestral home but then he is a most honorable man! And as if one white elephant riding the rails and wasting the tax-payers' money wasn't enough for Kerala, the Government has just started planning for another one, which seems more a white whale than a mere pachyderm! While the price tag for the light-rail-dressed-up-as-a-Metro was about Rs 6,000 Crores, the estimates for the proposed "High Speed Rail Corridor" is expected to be north of Rs 1,00,000 Crores! Having written in detail on how ludicrous and potentially fiscally disastrous this project would be, a couple of months ago, I am not going into the subject in detail but there are a few questions that neither the starry-eyed Government nor its 'usual suspect' consultants, DMRC and INKEL, seem to be interested in even pondering, let alone answering. Firstly, where is the market study to substantiate a project that will cost more than 8 times the annual Plan for the whole State? Bullet trains compete in speed and for passengers with airlines. In 2011, despite the massive expansion in airline and airline capacity capacity, the total number of airline passengers in India was equivalent to just about 5% of the nation's population. Since many people fly multiple times, the actual number of people who use airlines and hence would pay a premium for speed would be much lower. So are we suggesting that an investment that would essentially bankrupt the State be spent on a project that would benefit less than 5% of the population? Not to parody Obama and his 1% Vs 99% war cry, but in a country that still struggles with poverty, unemployment and even access to electricity and drinking water, there are surely better uses of any available funds. Next, other than providing high speed travel for a small section of people to and from a small number of stations, perhaps ten in all between Trivandrum and Kasargode, the bullet train provides no economic benefit because it cannot carry freight and hence cannot reduce the burden on Kerala's highways that are literally bursting with traffic and which will just get more congested when the 4.5 Million TEU Vizhinjam Container Transshipment Terminal comes on line. Even if high speed rail travel is a desirable end, there are ways and means of achieving speeds of up to 200-250 Km/hr even on conventional rails that are not only cheaper but can also carry freight. Finally, whoever decided that Kerala needs High Speed Rail? Was a complete transportation study of the State ever conducted to identify current and future demand patterns and the best technological solutions to meet them? No, of course not. When we have our resident spin doctors, the DMRC, advising bullet trains (we should be thankfully that they haven't pulled mag-lev out of their hats just yet!) as the magic bullet (pun intended!) to solve all of Kerala's transportation woes, no one will question it. Of course, sir yes sir! At this rate, we will have the same agency suggesting how to build the replacement for that aging dam north of Idukki and even how to save Malayalam cinema from a rampaging Santosh Pandit! And our well-meaning leaders will legislate a path clear for them. It's high time that we see through the smoke-and-mirrors act and understand which projects are realistic and will bring benefits to the State and which ones are very expensive pipe dreams. In the past few months, there has been a clear preference for the fanciful instead of the feasible and we have heard all sorts of ideas such as flying pod-cars, which should have gone to the trash bin not the State Cabinet. There has also been a distressing tendency for projects associated with Trivandrum like Vizhinjam, Technocity, the monorail (which, as opposed to its cousin in Ernakulam seems to have vanished into feasibility study oblivion), the International Convention Center and the Life Sciences Park to find scant mention in the Government's list of priorities, if any mention at all. Despite the fact that the Transport Minister was elected from the city, Trivandrum is still short of 10 Volvo buses which were paid for with JNNURM funds. Except for a few voices like Dr Tharoor, there's hardly a mention of Trivandrum even when a battle rages over mundane things as garbage disposal. When this Government got elected in May, I had a faint hope that things would be different this time around and that the State Capital and its projects would get fair attention. Alas, how wrong I was!! If Piravam doesn't vote as it should, we may be in for four more years of the same!